Beluga Point, a rocky outpost jutting into the waters of Turnagain Arm, is just south of Anchorage along the Seward Highway. It’s named for the white whales that are often spotted from this location as they make their way up and down the inlet. 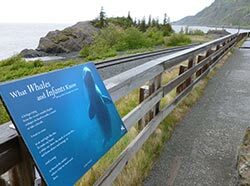 Interpretive signs and sculpted belugas are also featured at this point. Belugas are often seen from mid-July through August when salmon are running in Cook Inlet where their numbers have hovered between 300 to 375 whales since 2000. Belugas use sonar to find their way and catch fish in the silty waters of the inlet. Belugas are predators and also prey. Keep a sharp eye out for the black fins of orcas as they occasionally pursue the white belugas. Beluga whales are relatively small, often measuring less than 16 feet. Younger whales look blue-gray in color and then turn white by age five or six. Belugas are the only all-white whale. They may also be seen at other turnouts along Turnagain Arm and can be viewed occasionally at the mouth of the Kenai River in Kenai. This rocky promontory was once a site used by Native hunters. Take a stroll along the short pathways along this stony crag and listen to the wind and waves - it's not hard to imagine skin-clad hunters with bone-tipped harpoons using this point to scan for whales. Do not leave designated parking areas or pathways and do not venture onto the dangerous mudflats near the inlet. The turnout has paved parking, accessible spotting scopes and interpretive panels. Beluga Point is located at milepost 110.5 on the Seward Highway and 6.5 miles south of the Anchorage city limits.